A single stone, presented in all of its natural glory, sometimes makes for the most beautiful of adornments. That is definitely true of this simple but stunning 14K Solid Gold Ring with Natural White Topaz. This reflective ring features a single focal stone of White Topaz. 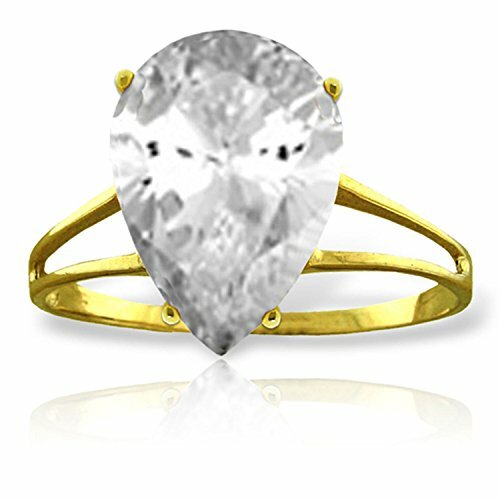 This pear shaped 5 carat stone is set on a cutout style 14K solid gold band that shows the gentle skin of your finger beneath. The stone itself measures an impressive 13X9mm. This ring is light, airy, feminine, and is something that you will own for a lifetime. This ring is great for cocktail parties.